10 June 2010, at 9:20a.m. GLOBAL - An institute belonging to the UK's Biotechnology and Biological Sciences Research Council (BBSRC) is working together with a number of research centres in India to save chickens by uncovering the genetic diversity of the parasite that causes coccidiosis. 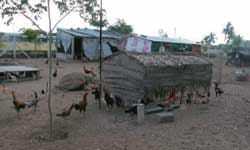 Chickens are widely farmed in rural poor households, providing an important source of dietary protein and a currency for local marketing and trade. Diseases that compromise the health or survival of poultry have major impacts on the livelihoods of the world's poorest people. Coccidiosis is a devastating poultry disease caused by seven species of protozoan parasites which attack the digestive system. Cost-effective, cross-species vaccines are a realistic prospect due to recent research that has identified key antigens and new technologies for vaccine delivery that include genetic modification of parasites. However, the parasites become resistant to drugs fairly rapidly and this is also a major consideration in the development of new vaccines to control the disease. Researchers from the UK and India are working together to overcome this by developing new multi-antigen vaccines. As part of this, the international team will look at the prevalence of different parasites responsible for coccidiosis and chart the frequency with which multiple infections and genetic exchanges occur between parasites and examine the effect this has on the growth and spread of parasites in infected chickens. Based on this, the researchers will develop vaccines and test them against field parasites to predict the likely efficacy and longevity of such vaccines. Collaborators on this project are Institute for Animal Health of the UK; Madras Veterinary College, India; Tamil Nadu Veterinary and Animal Sciences University, India; Chennai Institute, India; Veterinary Research Institute, Izatnagar, India; Indian Statistical Institute, Kolkata and Centre for Cellular and Molecular Biology, Hyderabad, India.